Okay, you're sitting down, and you're not holding any sharp objects, right? And not drinking any hot liquids? Good. I am impressed with the improvements made by United Airlines. I fly a lot, and the past couple of years have strongly prefered "new" airlines like Virgin and Jet Blue. Everything about these airlines seems better; their planes, their seats, the inside-the-plane experience, WiFi, food, their reseveration websites, customer service, etc. 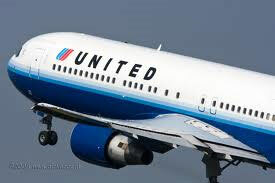 But of course I end up flying "old" airlines a lot too, because they have the routes, and I most often end up flying United. And so it was that on my recent trip to Chicago and New York - originally booked on Jet Blue - I had to rebook at the last minute, and ended up on United. And ... well ... it was great! Their website was great - it showed me all the choices, cleanly, including - and this is a longstanding complaint of mine - how I could use miles to upgrade. 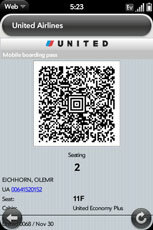 They have a spiffy facility for boarding passes on your phone - see Pre screenshot at left. There was plenty of room on the plane, and WiFi, and [working] power at my seat. And (can you believe) the food was good; I had a nice "tapas", a chicken wrap, etc., and plenty of diet cokes whenever I wanted. Rounding out my extended birthday, tonight we had a "family" dinner, with an absolutely excellent steak, mashed potatoes, and roasted vegetables (including - gasp! - Brussels Sprouts). Accompanied by a wonderful 2007 Carlson Pinot Noir (Santa Rita Hills - BTW I must tell you, every year 'they' say 'this is the best year since 1997', but I really think 2007 *is* the best year since 1997; the Santa Barbara Pinots in particular are amazing). Which leads me to introduce my saying of the month: Age improves with wine. Indeed. I am now 52, but I've switched to hexadecimal so this is 34. And I *feel* 34. I am determined to spend the next year acting 34, too. 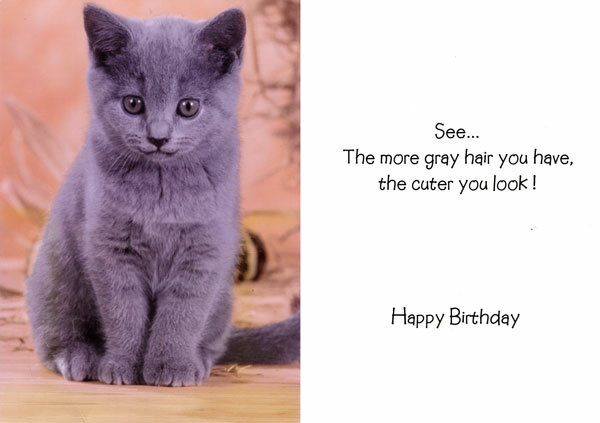 This was my favorite birthday card :) I am getting some gray hair, and Shirley assures me it makes me look distinguished - and cute. So be it.